This story is one I am revisiting. I posted this early on when I had very low traffic to the blog and I don't think many people read it. I love this story so I'm giving it a second run. A friend of mine who lives in a small town in South Alabama sent me the most wonderful pictures. In the one too the left if you look carefully you can see the face of a ghost staring out at you. She moved into her century old home a few years ago and when she first moved into the house it was haunted by an irritating spirit. My friend sent me the story of her haunted house and since I don't think I could possibly tell the story as well as she does I have placed it in quotes and put it word for word here. "The house was built in 1906, and is known as "the Warren House," although there is some dispute over who built the house. The Coles or the Warrens. Because of this dispute, we decided to put the name "Sherrod House" on our historical register sign. Next door is the McCleod house, built in 1903. When we moved here, 2 elderly McCleod sisters remained. Their story varied at times, but this is the best we could come up with from them. In 1906 the Cole family (allegedly) built the house. Sadly, they died while their children were still young, perhaps in the flu epidemic of 1918. Naomi Cole, and perhaps some of her siblings, went next door and were raised by the McCleods. When she was old enough, Naomi married a man, Mr. Warren, and moved back into her family home. When her husband passed, and her children moved, she turned the house into a boarding house, and many of the people in our town have memories of living here, or visiting their grandparents here, etc. Naomi left (died?) sometime in the early 1970's. Incredibly, the house stood vacant until we bought it in 2003. When we first bought the house, we loved it. It needed a lot of work- but we could see it's potential. My great grandmother was just moving into a nursing home, and we were blessed enough to get her old furniture. We visited the house at least once a month, while still living in Huntsville. Almost immediately, we felt a presence, but weren't too threatened by it. We would hear things in the middle of the night. Footsteps in the hallway, that sounded like a man's boots, slow and steady. We would groggily awaken, think to ourselves, "oh, he's just checking up on things," and fall back asleep. I don't know why we were so sure that it was ok, but we were. At other times we would hear the back door open. We would go to check it, and it would still be dead bolted. The activity began to become more common, to the point of where Michael and I were almost too spooked to stay in the house alone. A photo frame in the living room lifted itself from the mantle and flew across the room. One night, while MIchael and I were asleep, we heard very heavy determined foot stomping, across the length of the foot of our bed. It felt strongly like the spirit was trying to wake us up. Not knowing what else to do, Michael sat up in bed, said "Stop that! You'll wake the children!" The stomping stopped, and never happened again. But on another night, Michael woke up to someone pressing down on his chest. It took him a minute or two of struggling to sit up and breathe. It felt like something was trying to get our attention. On one night we allowed Chloe to have a friend spend the night. All 4 older children slept in the boys room, which has a closet that connects it to Lily's room. The children woke us in the middle of the night. "The ghosts are bothering us." Not wanting to scare them, we assured them that there was "no such thing as ghosts," and sought to calm them down. We all went back to bed. Early in the morning, I woke to find the kids terrified in the room. I tried to settle them down again. I looked into the mirror above the fireplace, directly beside the closet, which was latched shut with a hook and eye closure. I told them "There is no such thing as ghosts!" The minute I said that, the hook very slowly released itself from the eye, as if by an unseen hand. Then the closet door swung open and and a burst of icy air came rushing out. I looked at the kids, there was no denying ghosts now I supposed! Soon after this incident, we moved into the house full time. Lily was 3 years old at the time. At night, before going to bed, Lily would complain that there was a "grey lady" watching her. She always pointed to the same corner of the room, and told us that the grey lady would stand there when she was trying to sleep. Finally, in an effort to calm her, we began talking to the grey lady at bedtime. We asked her to please let Lily sleep in peace. After a week or so, this seemed to work, and that was the end of all the activity. We feel now, that whatever was haunting the house is not here anymore. The "presence" is gone. 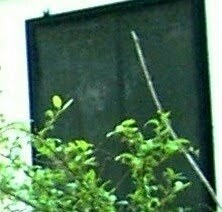 We never felt threatened, only a little spooked, and for some reason, we always felt like the spirits (one man, one woman, is what we felt) were just checking up on things. They seemed to want to know that the house would be taken care of. They seemed attracted to the children. I feel like they have accepted us here, and have moved on. We haven't seen any activity since the fall of 2005. What we have seen is a supposed granddaughter of Naomi. She showed up unannounced at our house while I was out of town on a business trip, and Michael spoke to her. She wanted to know if we had found anything that had belonged to her family in the house. She asked Michael if he had found a box of some sort. She kept pressing the point again and again, and asked Michael if he would be willing to sell the house to her. When he declined, she left. The McCleod sisters next door got very upset over this visit. They told Michael "whatever you find in that house is yours, and she has no business coming around here and bothering you!" We don't know why the McCleods would be so upset over Naomi's granddaughter coming for a visit. We have been all over the house, including the attic, which is almost as big as the 1st floor, and have not found any boxes. The fireplaces seem to have stopped being used at some point, there are gas lines near most of them. We don't know if there is maybe something in a chimney. We also don't know the identity of the ghosts that were here, though it seems to make sense that it would be the original owners of the house." Wow. Jessica. What a great story. How intriguing -- the part about the box and the sisters' reaction the the grandaughter's visit. That picture gives me shivers. What an interesting story. I wonder what was in the mysterious box ..... humm. yeah, I don't remember this one...I must have found your blog later...nevertheless, this is a great story!